Although some families find it helpful to spend time with older people with bleeding disorders it is important to remember that it can also be scary for patent who is new to the condition to meet people living with serious joint damage. A bleeding disorders diagnosis can have a serious impact on the whole family. Sibling relationships and rivalries are complex but there are surprisingly few studies look at families with a bleeding disorder. There are positive sides to having a brother or sister with a bleeding disorder. It can help improve a child’s ability to take responsibility as well as their communication skills. However, some siblings, especially sisters and middle children, can experience anxiety and feelings of guilt. It is striking brothers report that they believe that their own quality of life would be better if their sibling didn’t have a bleeding disorder. Siblings also say that they need more information about bleeding disorders and that they need more time and attention from the adults in their lives. A common mistake it to encourage guilt and to expect inappropriate levels of responsibility from young siblings; siblings shouldn’t be seen as supplementary care givers. However, it can be very helpful for siblings to feel involved and to be encouraged to ask questions and express their feelings about the impact of the bleeding disorder on the family. As far as possible parents should treat and discipline all their children the same way. However, ultimately, the best way to support children with bleeding disorders and their siblings is to support their parents and trust them to make good decisions. Seeing your child in pain can be extremely distressing; as can having to hold a child down to find a vein and for treatment. Parents often also feel an enormous weight of responsibility which can make it hard to let others, even another parent, care for a child with a bleeding disorder. However, family bonds can be strengthened by the experience and some parents are more relaxed once they can do treatment themselves at home. Adolescence is a difficult time for parents. It is hard to step back and let a young person start taking responsibility for their treatment and to make their own mistakes. Adherence to treatment can often worsen in this period as well. 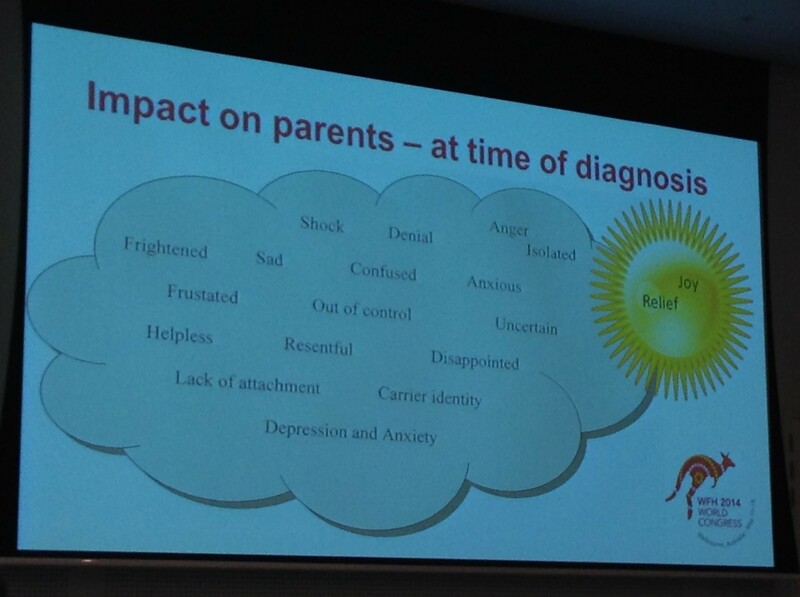 Transition to an adult Haemophilia Centre can also add stress; although often parents are more worried about this than their adolescent with a bleeding disorder. Haemophilia Scotland are very grateful to Baxter Healthcare UK for there generous support which enabled us to attend the WFH Congress in Melbourne. Dear Lord Penrose Please See that these scoundrels are put to light Sir. On Behalf of The Forgotten victims of tainted blood U.S.A.﻿ The Widowed and Orphaned families in America who are still being denied ANY Form of justice or legal recourse… Please Plead the case of the widow to the World and set the example of how a civilized society Should treat their Own. America Deserves to Know The Holocaust of “The Worst treatment disaster in world History”…And the American victims Plea for justice that has been silenced by Our Own Government. They were Victimized a Second and third time after through campaign contributions these people had the government secretly and quietly block their class action payout, Then Bribed the NHF in that shady L.A. hotel room deal where thousands of victims lost their voice when they sold the Bryant Brothers Bill the Fallow up to the Rickey Ray Act of Congress…The only thing remarkable about their “Remarkable Peace settlement” Is how quickly people will sell out the widow and orphan for greed and self interest. Shame them Sir. Their type of Corporate run Government is a menace to public health not to mention the crimes against humanity. This indifference has no place in our increasingly socially connected Modern world. Thank all who read for your time. Posted in loving memory of the Forgotten Victims of Tainted Blood U.S.A.